Frascati, No 45 Upper Newcastle. O’Donnellan & Joyce auctioneers has just launched its Wild Atlantic Way April auction. Buyers will be out in force to view the incredible selection of properties going under the hammer. The auction is set for Thursday April 18 in the Harbour Hotel, New Dock Road, Galway, and will feature an exceptional variety of properties from family homes to prime investments. Substantial four bed detached property currently operating as a B&B on College Road. This property has the potential to be a lovely family home or a superb business opportunity. No 12 College Road is situated on a large site rare for such a central location, just strolling distance to Galway’s coach and rail stations and the main shopping district. The Connacht Rugby grounds are less than three minutes’ walk away and the house is only a stone’s throw from Eyre Square. AMV €500,000. Large detached five bedroom family residence home comprising approximately 3,600sq ft of living space leading from the large central foyer. With views of Lough Rea lake and superbly located next to St Bridget’s College, this wonderful home is close to local shops and all the amenities that Loughrea town has to offer. AMV: €495,000. Cottage style bungalow on approximately 4.35 acres situated on Rosshill road in Roscam. The property has breathtaking and unobstructed views of Galway Bay and considerable frontage onto the foreshore. The house is in need of refurbishment but offers the potential to provide an excellent family home in a popular idyllic residential location. AMV €475,000. Rarely does such an opportunity come up. 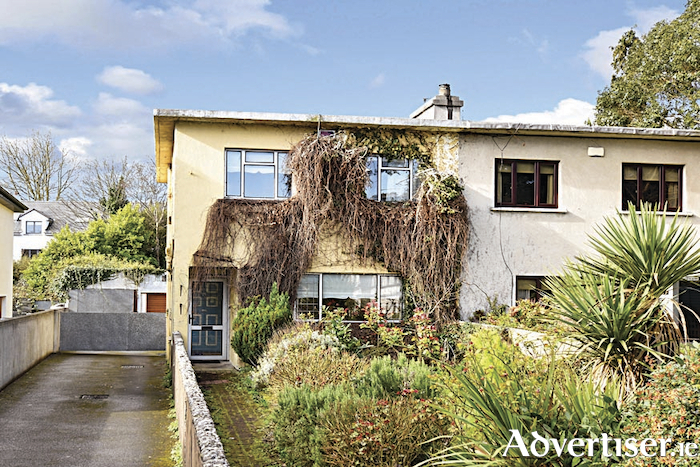 This substantial seven bedroom detached residence is located a stone’s throw from Salthill Promenade and only a few moments’ walk from Galway’s West End and Latin Quarter. This doer-upper presents somebody with a keen eye the opportunity to acquire a fabulous family home on a magnificent site. AMV €400,000. A large detached house on a substantial site. Moyola Park is on the doorstep of NUIG, well serviced by local amenities, and close to Galway city centre. Given the proximity No 6 Moyola Park could be an ideal investment property, while also hugely attractive to an owner occupier looking for a substantial sized property with excellent potential and a spacious garden that would be ideal for family living. A MV €380,000. Situated on the doorstep of NUIG and within walking distance of the city centre, No 45 Upper Newcastle is ideal for an investor or owner occupier to put their own touch on a property. Needing modernisation, the property is directly adjacent to the gates of NUIG. AMV €375,000. Semidetached five bedroom home that requires full refurbishment. Situated in a quiet cul-de-sac in a mature neighbourhood. Salthill amenities include the Promenade, diving tower, a host of popular cafes and restaurants, as well as quality primary and secondary schools. Devon Park is within walking distance of Galway city centre, with popular landmarks such as Galway's West End and Latin Quarter within easy reach. AMV €375,000. Presented in excellent decorative order, this property would be an ideal owner occupier residence due to its spectacular views over Galway Bay and the Clare hills, close to Barna village on the edge of Connemara’s breathtaking landscape. AMV €350,000. A rare opportunity to acquire a city centre townhouse. The property which is adjacent to the Courthouse in Waterside, Woodquay, would be a perfect residential investment with five large bedrooms and an attic which offers potential for additional accommodation. The property offers enormous commercial potential and as it located adjacent to the courthouse it would ideally suit as barrister's rooms for legal practice. A superb opportunity to acquire this city centre residential property. A true gem. AMV €350,000. Large detached residence with self-contained apartment offering tremendous potential to any purchaser. The property is situated on Monivea Road in the popular Mervue/Wellpark residential area of Galway city. While in need of modernisation the property is well presented and offers an excellent opportunity for a purchaser to create a beautiful home on a large attractive site. No 14 Monivea Road would be ideal for a purchaser looking to acquire a home with excellent potential in a well-established residential location with the benefits of the city on your doorstep. AMV €325,000. A delightful three bed family home in mint condition, located on the Cappagh Road, Knocknacarra, and surrounded by an abundance of recreational amenities such as Cappagh Park and Sporting Centre, football pitches, and running tracks which lead into Barna Woods, making this ideal for those who enjoy outdoor pursuits. In addition, the property is a leisurely stroll to Silver Strand and Barna village. Ideally suited for first time buyers as it has been entirely refurbished and modernised. AMV €300,000. Presented and maintained in excellent condition throughout with careful attention to details and decor, accommodation is both bright and spacious and is spread over three floors. The ground floor accommodation comprises an entrance hall, a downstairs toilet, a lounge with open fire, and an open plan kitchen/dining room. The attic is floored and accessed via a Stira stairs. AMV €290,000. Three bedroom family residence in Shantalla. Superbly positioned just a short walk from Galway city centre. Approximately 1km from UHG and 1.5km from NUIG. This property is a probate sale and would make a lovely family home with suitable renovations to upgrade the property. AMV €220,000. Mid-terrace three bedroom property with attic conversion in exceptional condition, located in a popular residential area. This would be a quality residential investment, or the perfect first time buyer’s home due to its close proximity to NUIG and UHG, making it the ultimate investment opportunity. In terms of convenience, the estate is located on an excellent road and bus network. AMV €225,000. Superb opportunity to acquire a commercial/residential investment in the heart of Loughrea, which enjoys a high profile position on the eastern side of the town. Loughrea is a thriving town of 6,000 people and is located off the Galway/Dublin dual carriageway. This is a modern refurbished premises comprising a ground floor commercial unit, which is currently occupied, and three modern one bed apartments overhead. There is also a large rectangular site to the rear with possible room for further extension (subject to planning permission ). AMV €120,000. See www.odonnjoyce.com to view the full list of properties on offer which include properties in Galway city and county, Mayo, Roscommon, Leitrim, Sligo, Donegal, and Limerick. Details are available from the auction team at O’Donnellan & Joyce auctioneers, 5 Mary Street, Galway, 091 564 212 or email [email protected]. Page generated in 0.1239 seconds.